Entries are now open for the 2019 Barnes Bay Regatta to be held on Saturday 6th April starting with a pursuit style feeder race from Wrest Point to Dennes Point at 0900 and then onto the Barnes Bay Regatta Race commencing at 1400 hours. Enjoy the night at Quarantine Station with the after race prize presentation from 7pm. Entry is $15 for adults and $5 for children under 12 years which included a fantastic BBQ and live music by Samuel Bester. 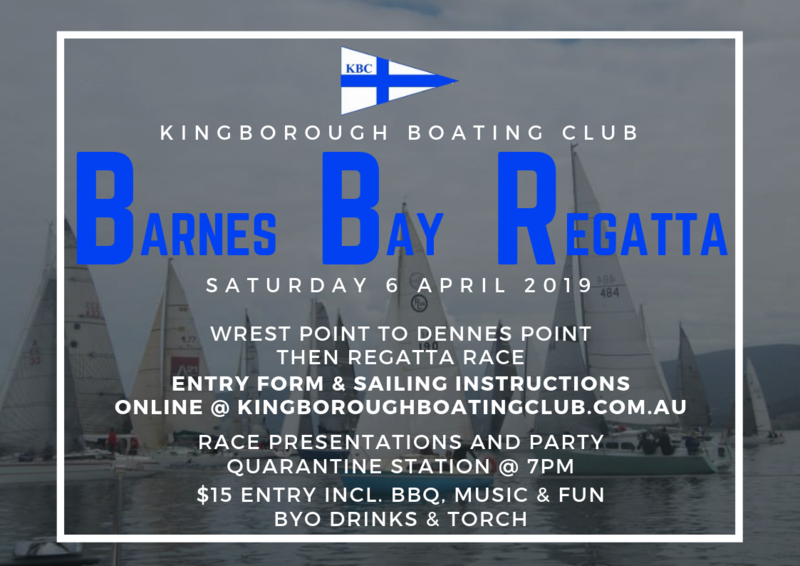 Please note this events is BYO drinks and torch and there will be no courtesy boat shuttle so we ask each boat skipper to ensure they have made arrangements to get their crew ashore and back from the venue. Prizes will only be awarded to boats whose crew are in attendance so come along and enjoy the evening. Get your entry in now. A Late Entry Fee applies to entries received after 5.00pm 3rd April 2019. Completed Entry Forms can be emailed to sailing@dssinc.org.au or lodged in person to the Derwent Sailing Squadron.